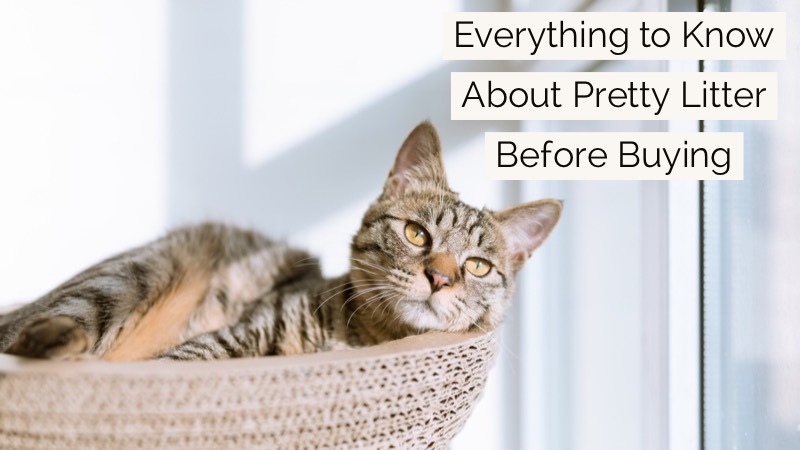 Pretty Litter is a kitty litter subscription service promising to save cat owners money while helping to keep felines happy and healthy. Their special litter formula enables it to last longer, smell better, and even helps detect digestive issues by changing color with use. With flexible pricing and free shipping, Pretty Litter aims to ease an age-old burden carried by all cat owners. How much does Pretty Litter cost? What does Pretty Litter detect? Pretty Litter can detect blood, acidity, and alkalinity abnormalities in your cat's urine. How long do Pretty Litter products last? One 4-pound bag of Pretty Litter lasts an entire month per cat. What do the Pretty Litter colors mean? Pretty Litter is odorless on its own, and uses special technology to trap and contain odor causing moisture better than traditional litter. Pretty Litter is completely safe for cats, even if ingested. It creates less dust and less overall waste, and is created from naturally occurring minerals. No. Pretty Litter's color cues are intended only as suggestions that your cat may be hiding an illness. Only a trained veterinarian can diagnose your pet. How do I contact Pretty Litter customer service? You can call Pretty Litter customer service at (800) 838-3381, or email them at meow@prettylitter.com. What is the Pretty Litter return and refund policy? Pretty Litter will accept a return for refund only in the event that the product is delivered in a damaged state. Visit PrettyLitter refunds for more information. Does Pretty Litter offer promotions? Pretty Litter occasionally releases promo codes. Bookmark Coupon Cause for updates! What forms of payment does Pretty Litter accept? How much is Pretty Litter shipping? There is no charge for Pretty Litter shipping and handling. Are you happy with the Pretty Litter offers on this page?